The Roaring Fork River, through the Grottos, late on Thursday, June 16, 2016. DENVER — Beneath the dim red glow of string lights at the Mercury Cafe in downtown Denver, about 25 people gathered Tuesday afternoon to rally support for a lawsuit against the state on behalf of the Colorado River. The case, the first of its kind in the United States, has the potential to shift American environmental law by granting nature a legal standing. The suit lists “the Colorado River Ecosystem” as the plaintiff along with people who hope to serve as “next friends” for the river and represent its interests in court. In an amended complaint, filed on Nov. 6, two more “next friends” were added to the case. 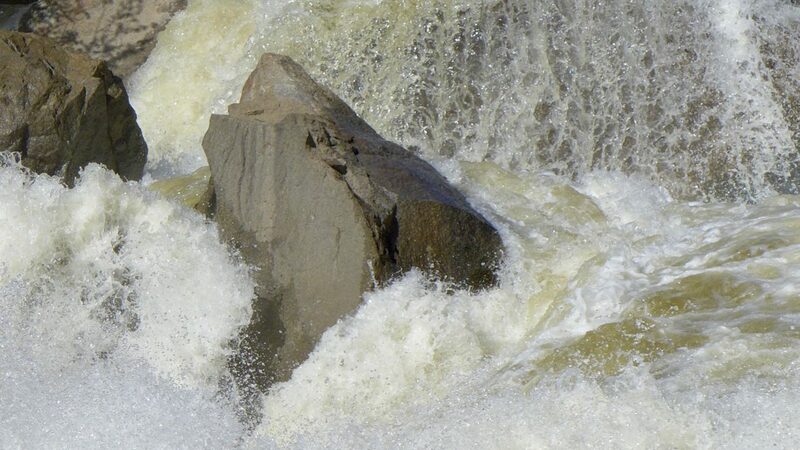 Owen Lammers of Moab is the executive director of Living Rivers, “which empowers a movement to realize social-ecological balance within the Colorado River watershed,” the amended complaint states. Living Rivers is a member of the Waterkeeper Alliance, a New York-based nonprofit dedicated to clean water founded by Robert F. Kennedy Jr.
“Because of Mr. Lammer’s significant relationship with, and dedication to, the Colorado River ecosystem, he is qualified to serve as next friend,” the amended complaint states. This is a change from the original complaint, which did not cite any particular relationship between the Colorado River and the members of Deep Green Resistance. Also added to the case was John Weisheit, who is “the person designated as the on-the-water ‘keeper’ per the Waterkeeper Alliance policies. In other words, Mr. Weisheit is the ‘Colorado Riverkeeper,'” the amended complaint states. 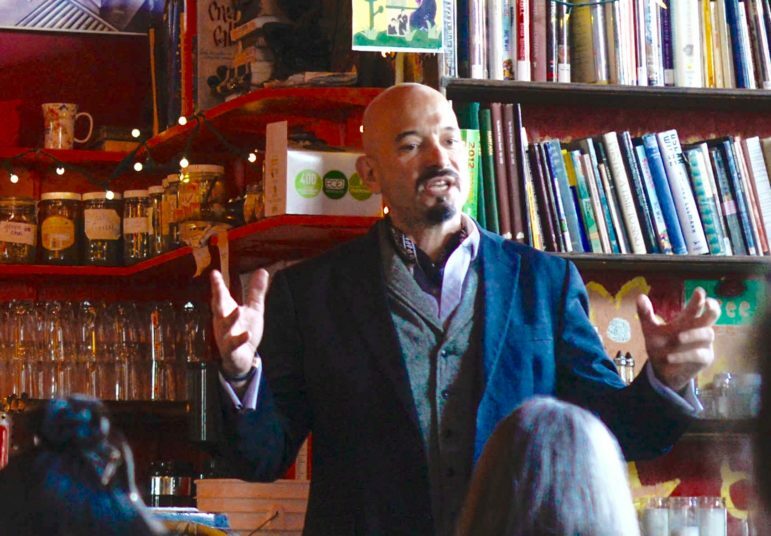 Jason Flores-Williams, the lawyer representing members of Deep Green Resistance in Colorado River Ecosystem v State of Colorado, speaks at a rights-for-nature meeting at the Mercury Cafe in Denver on Nov. 11, 2017. The state has moved to dismiss the lawsuit, and is expected to do so again in response to a recently amended complaint filed by Flores-Williams. Though the novel case is seeking personhood for the Colorado River ecosystem, the suit’s proponents hope to use it as a launching pad for a broader rights-of-nature movement. Rather than maneuvering within existing environmental law, where nature is considered property, rights-of-nature lawsuits seek to give the natural world rights to exist beyond its use to humanity. Margil and other rights-of-nature proponents say that our current environmental legal framework — which is based on legislation like the Clean Air Act and Clean Water Act — does not go far enough. They point to past court decisions that have granted legal rights to corporations, like the 2010 Citizens United case, and say nature should have that same standing. At the meeting in the café in Denver on Tuesday, activists supporting the lawsuit propped up poster boards that said “The Colorado River runs through us” and “Legal standing for the Colorado River,” that were made for a courthouse rally held earlier that morning. They kicked off their meeting with a slow chant praising “sacred Colorado waters” before sitting down to strategize about building support around the lawsuit. The group is planning protests, awareness campaigns, and other rights-of-nature lawsuits in an effort to open up the courts for cases defending ecosystems from environmental ills. So far, the case has moved forward only a couple of short steps. Flores-Williams filed the case on Sept. 25, which the state followed with a motion to dismiss on Oct. 17 on the grounds that the case does not fall under federal jurisdiction and lacked specific injuries attributable to the state. “The complaint alleges hypothetical future injuries that are neither fairly traceable to actions of the state of Colorado, nor redressable by a declaration that the ecosystem is a ‘person’ capable of possessing rights,” reads the motion to dismiss, which was filed by the Colorado attorney general’s office. The plaintiffs were then allowed to amend their complaint, and on Nov. 6 Flores-Williams filed a new complaint, invoking rights under the U.S. Constitution in order to keep the case in federal court. The map of the Colorado River basin included in the amended complaint filed on behalf of the Colorado River ecosystem by members of Deep Green Resistance and other “next friends.” The map understates the contribution of the Green River to the Colorado River system. 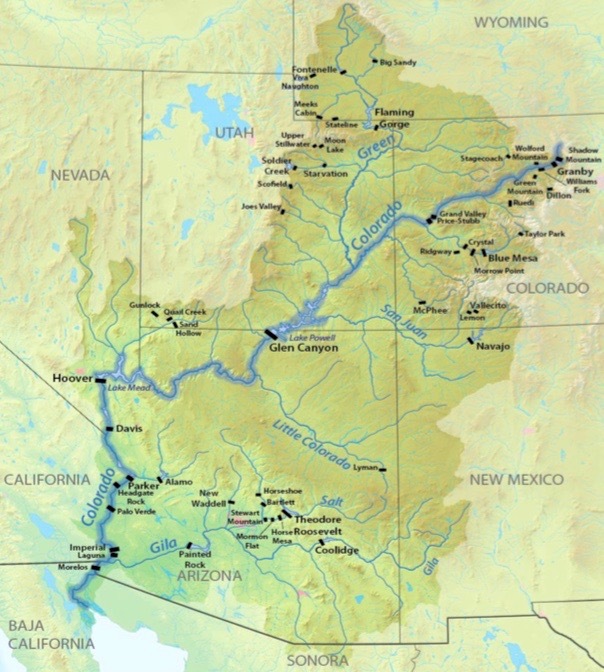 The amended complaint states that the Colorado River ecosystem includes the river’s “major tributaries” and “all the creeks, streams, and tributaries that feed them, along with the surrounding landscape where water percolates and flows underground,” and it includes a map of the entire Colorado River basin. And the amended complaint argues that by lack of such recognition the river’s rights are being denied under the due process and equal protection provisions in the U.S. Constitution. One thing the amended complaint did not do is correct claims in the original complaint that the state of Colorado operates a number of dams and reservoirs on the Colorado River system that are, in fact, operated by the Bureau of Reclamation or other water-management organizations, including Blue Mesa Reservoir on the Gunnison and Green Mountain Reservoir on the Blue River, both tributaries of the Colorado River. 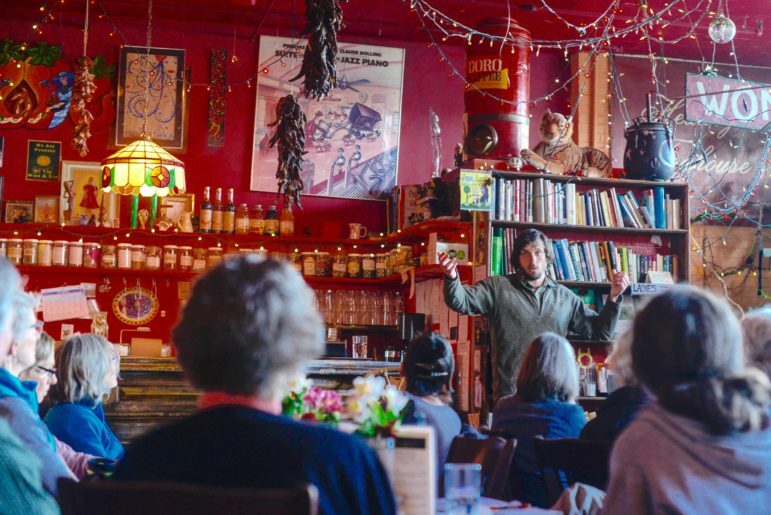 Will Falk, a member of Deep Green Resistance, speaking at the Mercury Cafe in Denver on Nov. 14, 2017. Falk is one of the named plaintiffs in Colorado River Ecosystem v State of Colorado, and has recently been traveling along portions of the Colorado River. The courthouse rally and the following rights-of-nature meeting were originally scheduled around a status conference slated for Tuesday, but the court vacated the hearing and gave the state until Dec. 1 to respond to the amended complaint. Flores-Williams expects the state will again move to dismiss the case. Regardless of the outcome of the lawsuit, the case’s plaintiffs plan to keep fighting against what they see as exploitation on the Colorado River and hope to inspire others to file rights-of-nature cases. “To support the idea that the Colorado River needs rights, I wanted to go see firsthand the problems along the river,” Falk said in a recent interview. Editor’s note: Aspen Journalism is covering rivers and waters in collaboration with the Glenwood Post Independent, The Aspen Times, the Vail Daily and the Summit Daily News. The Post Independent published a shorter version of the story on Sunday, Nov. 19, 2017.